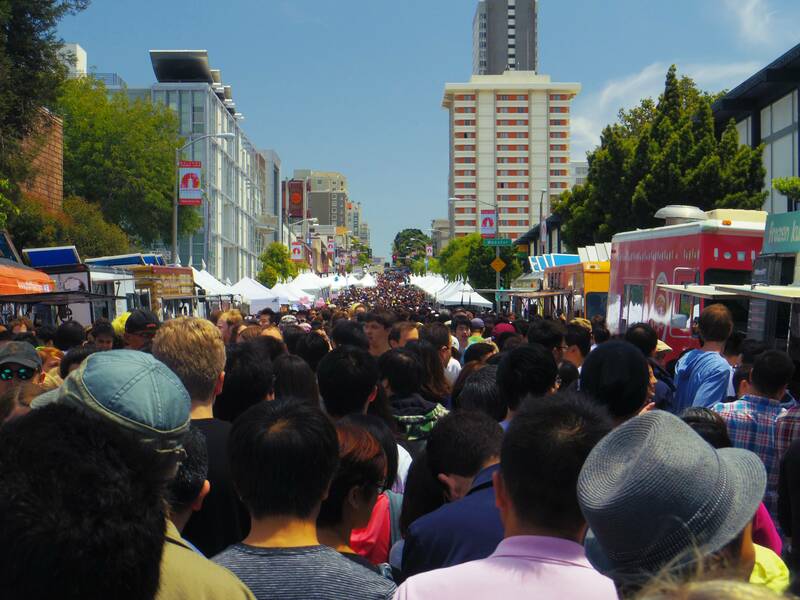 Last weekend in San Francisco Japan town decieded to have a Ramen Festival with well 6 booths. I don’t know what the organizers of the event were thinking because coincidentally they also had a Jpop Summit, 1000 Treasures event, and other misc events that created mad chaos in little Japan town in San Francisco. This was the Festival i thought i was going to. 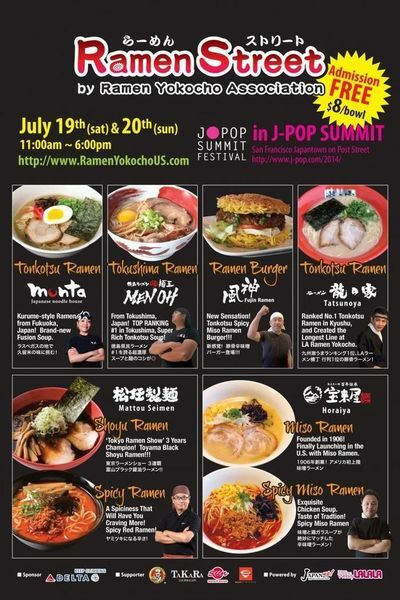 Okay so i didn’t notice the “J-pop Summit” on the flyer all i cared about was Ramen. Courtesy of the internet I found a couple of photographs because well it was too crowded to take a photo anyway without anyone getting in my way. There were lines to EVERY single restaurant – even the bad ones!. Well maybe not at Benihanas. lol. Notice in the photos – no one eating Ramen! via Yelp, seas of people. To soother our sad stomachs we left Japan town – after searching for a parking space for an hour and walking through the crowd for about half and hour… we headed towards HRD Cafe. Did it make up for the lousy festival? umm let’s just saw none of us were Hangry anymore. HRD was delicious! Here you can witness the deliciousness via photos. This my friends is a smothered burrito. Filled with MahiMahi breaded Katsu Style, along with Kimchee and season riced topped off with a heavy ladle of Japanese Curry topped with Kimchee Aioli and Spicy Sauce. To make up for the Ramen-less Saturday we spent the last two days eating Ramen from great places in San Jose. Last night we went to Ramen Halu for dinner. We got there around 6:30, it was a Monday. There was about 5 other people int he restaurant. No wait. Actually it was weird because there was too much attention given to us- we went use to at a go-to Ramen restaurant. There were Several Ramen options with portion sizes too. However their appetizers weren’t as appetizing as the other Ramen places I’ve been to. We skipped the apps and went straight for the Ramen. The HALU Ramen: A pork base broth, with seaweed, menma (bamboo shoots), Chaasu (pork), Spinach?, and green onions. It was ok. I like the noodles, the broth was just ok. Considered we went to a previous Ramen place that had a more distinct flavor of brother that i enjoys more. This broth was more on the porkier side, and the chaasu was definitely fattier. If looks meant anything this wouldn’t be as appealing as other bowls of Ramens I’ve consumed. Tantanmen , A Spicy Sesame broth with Mince pork, spinach and seaweed. This Bowl you can only order in Small or Regular. Tom was disappointed so instead he added a side order of Chaasu. i think he left hungry. Sunday Night we went to Kahoo Ramen for dinner. The wait… well Parking was a bit tough seems like everyone was at the Mitsuwa Mall and parking took a little longer to find, after a few circles around we found a spot right out front of Kahoo, I jumped out to see how long the wait was. The wait was basically how long it took Tom to walk to the restaurant, cause they do not seat parties until they are complete. fair is fair. Chicken Karage… I remembered Karage to be little nuggets or chunks of chicken this time around they had slabs fried in their same wonderful crust. Kokumaru Shoyu, Hands down this was Delicious. I usually get the Kotteri Miso but opted for something new and i think this is my new favorite. It had everything you can dream of in a ramen, A soft boiled egg (well sorta soft), green onions, corn (thanks to Tom), Menma, Chassu, and pork fat flakes. Love love love this one oh yes, plus extra noodles! It was a bit oily, but seriously it was worth consuming. Tantanmen, Spicy Sesame Soup for Tom. He loved it. HE also scooped out the corn for me. He loved this. It was pea nutty, rich, thick, and all around filling. He preferred this Tantanmen rather than Ramen Halu. A few Weeks ago we went to OrenchiRamen for dinner. The wait was so so about 30 minutes. We listed our names and waited, and waited. the hostess come out checked the clip board then crosses out the bottom portion which means they used up most of their broth. The pull in their signs and turn off their open sign. They then only serve who ever is listed on the clip board. First things first. I love appetizers. Out of most of the Ramen places I’ve been to,Orenchi had the most selections I wanted to just eat appetizers for dinner. But that defeats the purpose of going to their restaurant because they are known for their Ramen. The Takoyaki Balls – Octopus Balls. Well more like one slice of octopus in each ball. Eh so so the dough was good, but wish they had more octopus in them. I love the bonito flakes on them… is that what they are? all server with the Japanese worcester sauce and mayo. Where is tom’s bowl? He ate it before i can take a photo. that is ok. The couple beside us ordered two bowls. The took out two glass containers, one look insulated they split one bowl at the restaurant then took the other bowl home. First they separated the noodles from the broth. Very clever! Now I wish I can get Ramen for lunch. ← A Summer Solstice Wedding.